Blue jeans are casual pants made from denim, noted for their strength and comfort. They have been worn by sailors and California gold miners as sturdy work pants, by the young as a statement of their generation, and by the fashionable, who are conscious of the prestige conveyed by designer names. Denim cloth itself has an unusual history. The name comes from serge de Nimes, or the serge of Nimes, France. Originally, it was strong material made from wool. By the 1700s, it was made from wool and cotton. Only later was it made solely from cotton. Originally, it was used to make sails, but eventually, some innovative Genovese sailors thought it fit that such fine, strong material would make great pants, or "genes." The name for blue jeans was derived from the color of the fabric used to make them. Denim was treated with a blue dye obtained from the indigo plant. Indigo had been used as a dye since 2500 B.C. in such diverse places as Asia, Egypt, Greece, Rome, Britain, and Peru. Blue jean manufacturers imported indigo from India until the twentieth century, when synthetic indigo was developed to replace the natural dye. Blue jeans in the form we know them today didn't come about until the middle of the nineteenth century. Levi Strauss, an enterprising immigrant who happened to have a few bolts of blue denim cloth on hand, recognized a need for strong work pants in the mining communities of California. He first designed and marketed "Levi's" in 1850, and they have stayed essentially the same ever since; there have been only minor alterations to the original design. Original Levi's did not contain rivets. A tailor by the name of Jacob Davis invented riveted pants at the request of a miner who complained that regular pants were not rugged enough to hold his mining tools. Davis subsequently granted Strauss the use of his rivet idea, which was patented on May 20, 1873. Few other changes were made over the next century. Zipper s replaced button flies in 1920 (although later button flies had a resurgence of popularity) and in 1937 the rivets on the back pockets were moved inside in response to complaints from school boards that the jeans students wore were damaging chairs and from cowboys that their jeans were damaging their saddle s. In the 1960s, they were removed entirely from the back pockets. Blue jeans started becoming popular among young people in the 1950s. In the year 1957, 150 million pairs were sold worldwide. This growing trend continued until 1981 and jeans manufacturers were virtually guaranteed annual sales increases. In the United States, 200 million pairs of jeans were sold in 1967, 500 million in 1977, with a peak of 520 million in 1981. When jeans first caught on, apologists reasoned that their low price determined their huge success. During the 1970s, however, the price of blue jeans doubled, yet demand always exceeded supply. Sometimes manufacturers met the demand by providing stores with irregulars; that is, slightly defective merchandise that would not normally be sold. The first two steps in blue jeans manufacture are carding and spinning. 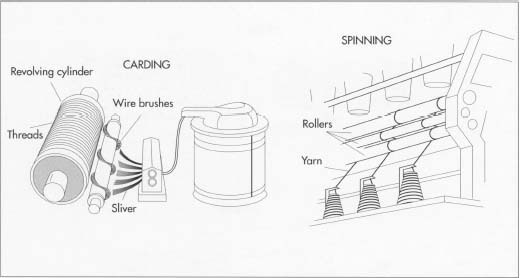 In carding, the cotton is put through a machine with bent wire brushes. The brushes clean, disentangle, straighten, and gather the cotton threads into sliver. After several slivers are joined together, they are put on spinning machines that twist and stretch the cotton to form yarn. returned to the height of popularity they achieved in the seventies. Manufacturers must therefore constantly seek ways to keep the demand for blue jeans high. Believing that the decrease in demand reflects the changing needs of an aging population, jeans manufacturers have begun to cater to the mature customer by providing roomier, more comfortable jeans. Sally Fox, an entomologist, has developed cottons that naturally come in beige, brown, and green. The Levi Strauss Company now markets multicolored jeans as well. The company hopes to ride the popular wave of environmentalism, even advertising their new product on recycled denim. Although blue jeans have remained basically the same since they were first designed, they have always been versatile enough to meet market demands. Since futuristic, yet familiar, "Levi's" appeared in the movie Star Trek V, it can be surmised that manufacturers as well as the public, expect blue jeans to be around indefinitely. True blue jeans are made out of 100 percent cotton, including the threads. Polyester blends are available, however, the over-whelming majority of jeans sold are 100 percent cotton. The most common dye used is synthetic indigo. The belt loops, waistband, back panel, pockets, and leggings of a pair of blue jeans are all made of indigo-dyed denim. Other features of blue jeans include the zipper, buttons, rivets, and label. Rivets have been traditionally made of copper, but the zippers, snaps and buttons are usually steel. Designers' labels are often tags made out of cloth, leather, or plastic, while others are embroidered on with cotton thread. Denim, unlike many types of cloth (which are woven in one place and sent to another for dying), is woven and dyed at one location. Unlike many other cloths, denim is dyed before it is woven. The dye used is generally a chemically synthesized indigo. The denim is dipped in the dye vat several times so that the dye forms many layers. This explains why blue jeans fade after washing. The yarn is then woven on large shutle-less looms. The blue threads are woven with white threads, but because the blue threads are packed closer together than the white ones, the blue color dominates the cloth. cotton fibers. At this point, the fibers are called slivers. 2 Other machines join several slivers together, and these slivers are then pulled and twisted, which serves to make the threads stronger. Next, these ropes are put on spinning machines that further twist and stretch the fibers to form yarn. 3 Some cloths are woven (see step 5 below) and then dyed, but denim is usually dyed with chemically synthesized indigo before being woven. Large balls of yarn, called ball warps, are dipped in the indigo mixture several times so that the dye covers the yarn in layers. (These many layers of indigo dye explain why blue jeans fade slightly with each washing.) Although the exact chemicals used in such dyeing procedures remain trade secrets, it is known that a small amount of sulfur is often used to stabilize the top or bottom layers of indigo dye. 4 The dyed yarn is then slashed; that is, it is coated with sizing (any one of a variety of starchy substances) to make the threads stronger and stiffer. Once this operation is complete, the yarn threads are ready to woven with undyed filling yarn threads. The denim cloth is cut into pattern pieces from stacks 100 layers thick. High-speed cutting machines are used for this process. Once the pieces are cut, they are sewn into completed pairs of blue jeans. Sewing is done in assembly-line fashion using human-operated sewing machines. threads). Because denim is woven with the blue threads packed closer together than the white threads and with the blue threads covering three out of four white threads, the blue threads dominate. (By examining a piece of denim closely one can detect the steep diagonal pattern that results from this process, which is known as a three-by-one right-hand twill weave.) Although mechanized looms make use of the same basic weaving procedure as a simple hand loom, they are much larger and faster. 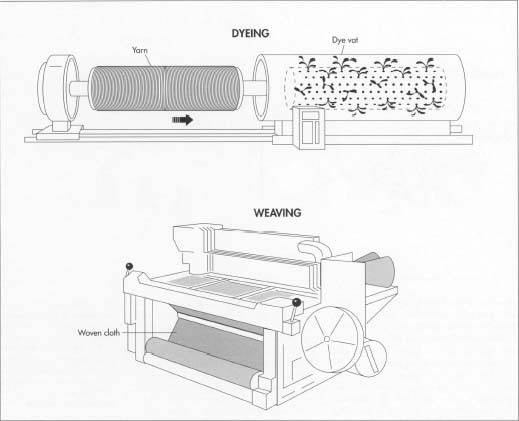 A modern "shuttle-less" loom (which uses a very small carrier instead of the traditional shuttle to weave the weft threads between the warp threads) may produce as much as 3,279 yards (3,000 meters) of cloth 3.28 or 4.37 yards (three or four meters) wide in a single week. As much as 1,093 yards (1,000 meters) of cloth may be rolled into a single huge bolt. 6 At this point the denim is ready for finishing, a term referring to a variety of treatments applied to cloth after it is woven. With denim, finishing is usually fairly simple. The cloth is brushed to remove loose threads and lint, and the denim is usually skewed in a way that will prevent it from twisting when it is made into clothing. The denim may then be sanforized, or preshrunk. Preshrunk denim should shrink no more than three percent after three washings. 7 Once the desired design is selected, patterns from the design are cut from heavy paper or cardboard. Up to 80 different sizes are possible from one pattern. The pieces of denim are then cut with high speed cutting machines from stacks 100 layers thick. Excluding rivets, buttons, and zippers, a pair of blue jeans contains about ten different pieces, from the pockets to the leg panels to the waistband and belt loops. 8 The pieces of denim are ready to be sewn at this point. Sewing is done in an assembly line fashion, with rows of industrial human-operated sewing machines. Each sewer is assigned a specific function, such as making only back pockets. First, the various pockets and belt loops are assembled. Next, one sewer attaches the pockets to the leg seams, another then sews the leg seams together, and still another attaches the waist-band. Once the waist band is secure, the belt loops may be stitched on and the buttons attached. 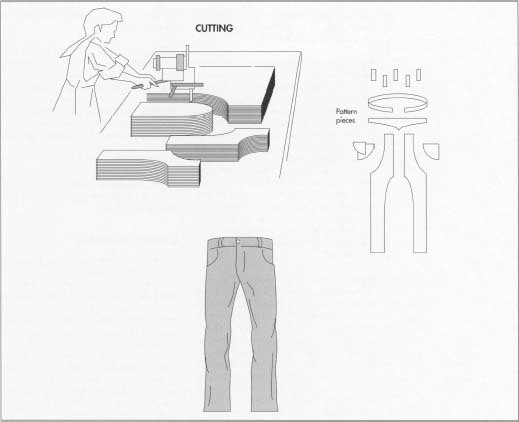 If the jeans include a zipper, it is then sewn into place, and the pants are hemmed. Finally, the rivets are placed in the appropriate places and the maker's label is sewn on last. 9 Some jeans are prewashed and/or stone-washed to alter the appearance or texture of the finished jeans. Prewashing involves washing the jeans in industrial detergent for a short time to soften the denim. Stone-washing also means washing the jeans, but pumice is added to the load, resulting in a faded appearance. Small stones (less than one inch [one centimeter] in diameter) produce an even abrasion, while large stones (about four inches [10 centimeters] in diameter) highlight the seams and pockets and produce a more uneven appearance. 10 The completed pair of blue jeans is I 0 then pressed. They are placed into a large pressing machine that steam irons the entire garment at once in about a minute. A size tag is punched into the material and the jeans are folded, stacked, and placed in boxes according to style, color, and size before being sent to the warehouse for storage. When the jeans are selected to be sent to a store, they are put in large shipping cartons and sent on freight trains or trucks. The process of cloth making involves treating the fabric with a number of chemicals in order to produce clothing with such desirable characteristics such as durability, colorfastness, and comfort. Each step of finishing the cotton fabric (dyeing, sanforizing, etc.) produces byproducts, most of which are biodegradable. Byproducts of denim manufacture include organic pollutants, such as starch and dye, which can be treated through biological methods. These organic wastes may not be dumped into streams or lakes because of their high biochemical oxygen demand. To decompose, such waste materials utilize so much oxygen that the lifeforms in the body of water would be denied the oxygen necessary for survival. Denim manufacturers process their own wastes in compliance with all relevant government regulations. Cotton is a desirable natural fiber for several reasons. Cloth made from cotton is wear resistant, strong, flexible, and impermeable. Blue jeans are only as good as the cotton that goes into them, however, and several tests exist for cotton fiber. All bales of cotton are inspected by the denim manufacturer for the desired color, fiber length, and strength. Strength is the most important factor in blue jeans. It is measured by using a weight to pull it. When the fiber breaks, the force used to break it is measured. The cotton's strength index (weight of weight divided by weight of sample) is then calculated. The finished denim cloth is carefully inspected for defects. Each defect is rated on a government-defined scale ranging from one point for very small flaws to four points for major defects. Although government regulations allow cloth with a high defect rating to be sold, in reality customers will not accept denim with more than seven to ten defect points per square meter. Poor cloth is sold as damaged. Denim is also tested for durability and its tendency to shrink. Samples of cloth are washed and dried several times to see how they wear. Blue jeans are also inspected after they are completed. If a problem can be corrected, the jeans are sent back for re-sewing. The pair is then inspected again and passed. The buttons are inspected to ensure that they and the buttonholes are of the proper size; the snaps, metal buttons, and rivets are checked for durability and their ability to withstand rust. The zippers must be strong enough to with-stand the greater pressures of heavy cloth, and their teeth durability must be checked as well. This is done by subjecting a sample zipper to a lifetime of openings and closings. Cray, Ed. Levi's. Houghton Mifflin, 1978. Fehr, Barbara. Yankee Denim Dandies. Piper Publishing, 1974. Finlayson, lain. Denim. Simon and Schuster, 1990. Henry, Sondra and Emily Taitz. Everyone Wears His Name: A Biography of Levi Strauss. Dillon Press, 1990. Adkins, Jan. "The Evolution of Jeans: American History 501," Mother Earth News. July/August, 1990, pp. 60-63. Brooks, John. "Annals of Business: A Friendly Product," The New Yorker. November 12, 1979, pp. 58-94. I would like to know more abt how denim is manufactured. where can I find the different thread numbers weaving jeans ? i would like to know how denim is made originally and by who and where it came from and how it was placed in lava to kill off the noise of the murrumby cod. Most jeans are made of 98% denims and 2% cottons. Of cause, Making jeans needs accessories such as zippers,rivets,buttons and so on. Trust me, the answer are from jeans factory.